This premium #4 business paper is acid free paper of archival quality and printableon both sides. It is electronic image capable. 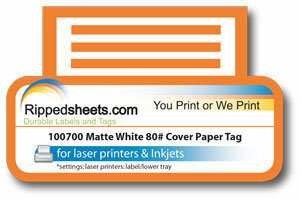 This will serve multiple needs in the ability to microperforate and/or fold score sheets in low to medium quantities. Caliper is 0.0075″. Microperfing and/or scoring twiceacross (AC) or twice down (DN) is included in the price without a die charge. Prices are per sheet. This material meets US Postal Service Automation Design Standards for postcard minimum weight ( 7 pt. (0.007″)).